1. Use your mouse to click and place the customer's vehicle on the work shop's track. 2. Start your day with a capital of $1500. 3. Each LEVEL will be changed to each day. 4. Each day, a total of $100 will be deducted automatically as “Rental”. 5. Purchase “Stocks” (Petrol, Tyres & Spare Parts) with remaining money. 6. Capital will be deducted accordingly to the inventory purchased. 7. Successful sales will add $50 on top of the earnings from item. 8. Customers Lost (out of stock & time waiting) will deduct 10% from account. 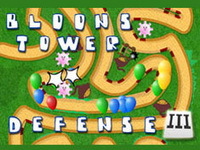 Build towers along the maze to destroy the waves of creeps. This game is the sequel to Flash Element TD and it is everything one wants from a sequel: better graphics, deeper game play and more options.